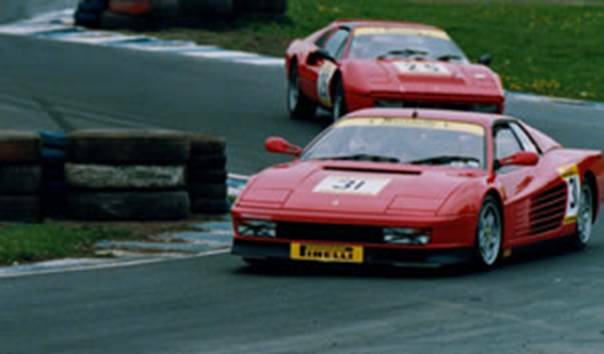 Adrian Walker, city analyst, Ferrari cognoscente and would be racing driver, campaigned his Testarossa in a few track days around UK circuits. Having loads of fun learning the craft and the circuits Adrian definitely got a full dose of “the bug” and developed a massive need for speed. Adrian followed that well trodden path... “I need more power”, and after a few calls he quickly found out that there were precious few companies out there who would take on a flat 12 Ferrari engine that already makes 450 bhp and promise to deliver more. Less weight? Same problem... nobody makes lightweight bodywork for a Testarossa. So finally how to improve the handling? At the time DTM Power were looking after the front running cars in the Maranello Ferrari Challenge, so we had a high profile in that area, Adrian found us from our advert in Ferrari Competition News. At last he was on the right track. Adrian told us the story so far, I booked him in for a full suspension geometry check over. After a full 3D suspension measuring session we produced a drawing of all the relevant parts and systems. In addition, we weighed the car, and weighed the unsprung components; these are the bits below the springs, in contact with the road, so wheels/tyres/uprights/brakes and so on. This will usually reveal some of the reasons why the car is not at its peak of handling perfection. In the case of the Testarossa; a massive imbalance of roll centre heights and nowhere near enough camber change with bump were just the headline issues. We discussed the options and after Adrian gave us the go ahead, we started work on a schedule of improvements. The most significant of which was the change to the suspension geometry to get the roll centres at the right height and at the same time get some camber change going on. Minimising bumpsteer was also high on the priority list. The new parts inventory include; new bottom wishbone pivots, front and rear anti-roll bars, revised springs and dampers with adjustable rates. So... no more horsepower and no lightening then! Once completed, back to the track... after a bed in period and a few laps to learn the new handling characteristics, Adrian’s confidence began to build. He was now giving the Golfs a run for their money, and can use all 450 of the standard Ferrari engine’s bhp coming out of bends like a bullet with far more speed carried through. Far quicker corner entry speed maintained right through the bend. Caterhams were falling behind now, Adrian was cleaning up (steady... these are track days, not races!). By the end of the season Adrian was at the front and lacking a challenge. As we were already running cars in the Maranello series I suggested that Adrian get into racing proper. He went for it like a rocket! The car was soon back to our workshop and as there was nobody producing light weight parts for Testarossa, we did! Adrian commissioned us to make boot bonnet and doors in carbon fibre. We moved across from road tyres to slicks, and that meant a change to the geometry, springs and dampers to get the best from these more demanding tyres. In the new season we found ourselves running another full race client: Adrian Walker. This time we were at Spa in Belgium with a brand new car, a novice racer fresh out of ARDS school, yellow cross in place and our fingers crossed. Nothing to worry about here... Adrian did us proud, pole position and he lead the race from start to finish!